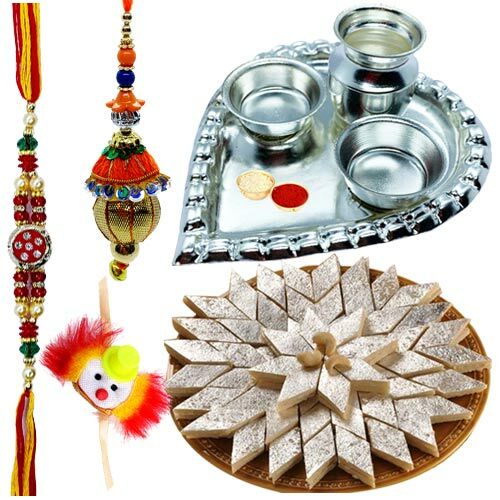 Let your dearest ones indulge in the best Raksha Bandhan celebration of their lives by gifting them this Trendy Silver Plated Thali with Kaju Katli and Rakhi that is wrapped along with a free Rakhi, Roli Tilak and Chawal complemented with your love. Send your best wishes to your sweetest brother with this amazing pair of Bhaiya Bhabi and 1 Kids Rakhis along with Silver Plated Paan shaped Puja Aarti Thali stuffed with 100 gm. Kaju Katli on the special occasion. A little Variation in the design may occur.